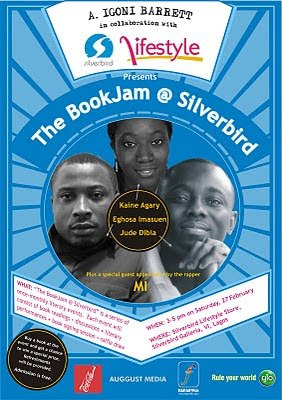 Writer A. Igoni Barrett (author of From Caves of Rotten Teeth and convener of the 9 Writers, 4 Cities book tour) will, in collaboration with Silverbird Lifestyle media store, host a monthly series of literary events tagged The BookJam @ Silverbird. Why it is? To provide literary entertainment for the public, create opportunities for book lovers to meet and discuss with writers and artists, to support the local literary community. Where? Silverbird Lifestyle store, Silverbird Galleria, Ahmadu Bello Way, VI, Lagos. • Jude Dibia, author of Walking with Shadows and Unbridled and winner of the 2007 NDDC/ANA-sponsored Ken Saro-Wiwa Prize for Prose. For more information about the BookJam please send an email to auggustmedia@gmail.com. The University of Texas at Austin and Dell are searching for student social entrepreneurs all over the world to dream up ingenious ideas to change the world. College students worldwide are invited to enter the 2010 Dell Social Innovation Competition for a chance to win $50,000 to turn their ideas into a new business or nonprofit with a mission to change lives for the better. prizes to student social entrepreneurs. Vital Voices welcomes applications and nominations for participation in our African Women Artisans Product & Development Program 2010 Training Workshops with support from the ExxonMobil Foundation. This workshop will provide women artisan business owners and business leaders with information and expertise in product and export development. Vital Voices will cover all program and travel costs. 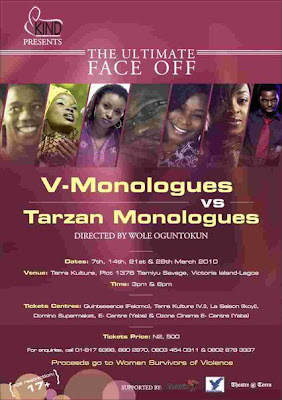 The workshop will hold in Lagos,Nigeria from July 19-23, 2010. Applications are due by Monday, May 3rd, 2010. Visit the Vital Voices website for more information. The African Development Bank (AfDB) Group’s Young Professional Program (YPP) aims at attracting the best and brightest from its member countries – both regional and non-regional. Through the Young Professional Program, the Bank Group will ensure continuity both in the management of projects and the provision of policy advice to its regional member countries. Young Professionals have the opportunity to work across the continent and be at the forefront of exciting Bank initiatives that are helping to shape Africa’s future. Deadline is March 15, 2010 (Midnight, Tunisia time). In response to the devastating earthquake in Haiti, AWID has launched a special section on their website designed to provide a wide range of information on the context of the crisis, the latest analysis on the aftermath of the earthquake, how the crisis is impacting women and women's rights, how to ensure women's rights are at the centre of responses to disasters, and how you can act in solidarity with the women, men and children of Haiti. The new web section is part of AWID's ongoing efforts to support feminist contributions to relief efforts in Haiti by fostering awareness about what women's organizations are doing on the ground and in other parts of the world. Visit the AWID Haiti and Women's Rights section. 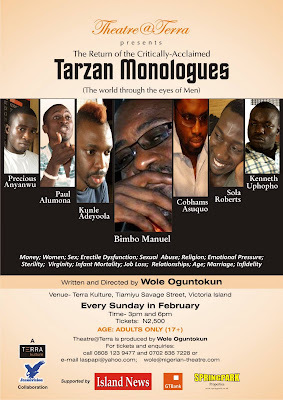 Theatre@Terra brings The Tarzan Monologues back for the month of February.